Fiona Boyes plays deep Blues, influenced by a myriad of traditional regional styles. Winner of the International Blues Challenge in Memphis, USA, (the first Australian and the first woman to do so), Fiona has also received Blues highest international accolade with 4 successive USA Blues Music Awards nominations for both her electric and acoustic playing. Extended tours over the past year have offered her the opportunity to perform at jazz/blues festivals, clubs & cultural centres in 9 different countries. She is a distinctive finger-style guitarist with a soulful, authoritative style, presenting predominantly original material firmly rooted in the blues tradition. Fiona continues to joyfully explore the music she loves with recent acquisitions such as 4 & 6 string cigarbox guitars and a rare ResoLectric Baritone guitar adding new textures to her live show. 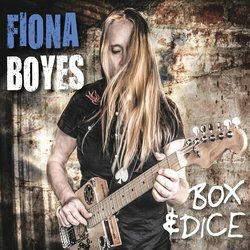 With 9 previous albums to her name, her new album - ‘Box & Dice’ - showcases these instruments and songs. Come and enjoy an original, intriguing road-trip through the Blues! A swampy blues song, played on cigar box slide guitar, about a real 'juke joint' in Tallahassee, Florida. I've played there several times - the address really is Moses Lane. On this track I've also used an unusual baritone guitar instead of bass to make it more down-home.